Nothing is off-limits when it comes to tattoos. After all, tattoos are a form of expression, so everyone can experiment with them as much as they want. There are many types of tattoos you can have. Some are very common, while others only interest certain groups of people. What about heartbeat tattoos? Some people find them very artistic, while others think they’re a bit to minimalistic for their taste. If you and your partner are looking a perfect couple tattoo, this could be a choice because it’s actually meaningful despite the simple appearance. It could still be intricate, though, so don’t rule out the possibility especially if you rarely stick with simple designs. Firstly, pick a design that you both like. It can be a daunting task if both have very different tastes. The safest bet is to go with a common choice, a design that people usually find appealing. This way, you won’t regret it later. Next, decide whether it will be permanent or not. A permanent tattoo is hard to remove, so please be careful. Once the picture gets tattooed on your skin, be prepared for questions from acquaintances because they will be curious about it especially when you put it on a very visible area. Isn’t it awesome to explain to people the meaning behind the heartbeat tattoo? It can show how much you love your partner. It can also be a sign that you’re taken without needing to tell anyone. With the bunch of designs available, heartbeat tattoos easily stand out mainly because they depict human emotions. They may look simple just like patterns of a pulse monitor, but in reality those pattern symbolize energy, movement, and preciousness of life. Anyone who is still alive has that and it keeps flowing steadily as long as we live. The thing about a tattoo is you can put your spin on it even if the original idea seems pretty simple. We know that a heartbeat looks simple right, but a tattoo is like a painting. You can add your own creativity to make it feel more personal. There are a few reasons why people love these tattoos. For those into simple designs, they make a perfect choice because heartbeat tattoos aren’t difficult to make. It’s basically just one long line in one color. It doesn’t need another ink if you want to keep it simple. But if you want a more intricate design, there are endless possibilities. Just tell the tattoo artist what you need, so that he can integrate those ideas into the work of art. 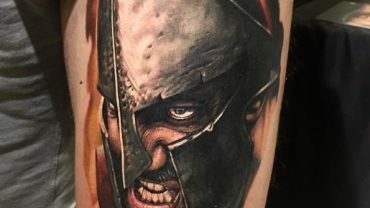 You can even add unique imagery that people don’t usually expect from such a tattoo.